However, most serious cases of intestinal coccidiosis are caused by Eimeria necatrix (and fewer, but still serious, by Eimeria brunetti). Both develop within deeper tissues of the small intestine and besides Eimeria tenella are major pathogens of poultry. 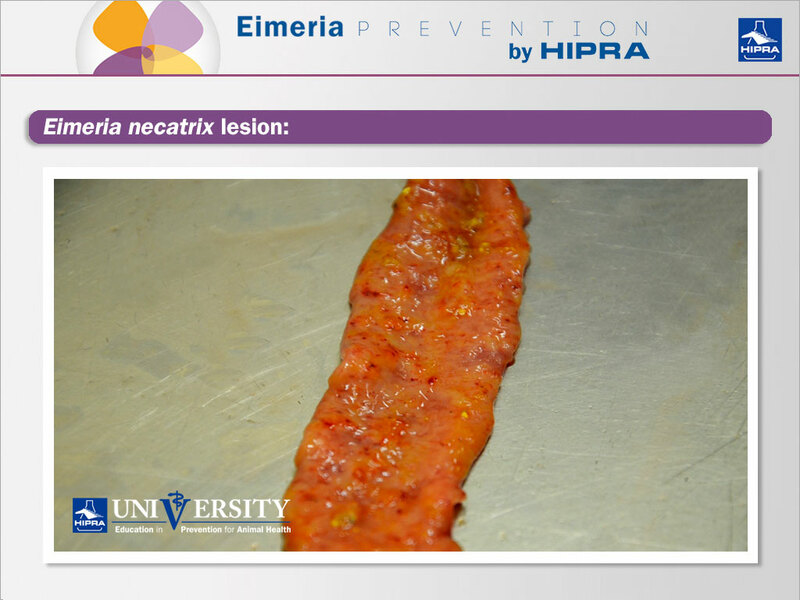 Eimeria necatrix and Eimeria brunetti mainly affect birds of more than 8-9 weeks of age. Recently, the evolution of the production systems with an ever-increasing percentage of laying hens that are floor-reared or reared in systems such as aviaries has shown a clear influence on the incidence of coccidiosis outbreaks, caused not only by Eimeria tenella, but also quite frequently by Eimeria necatrix. 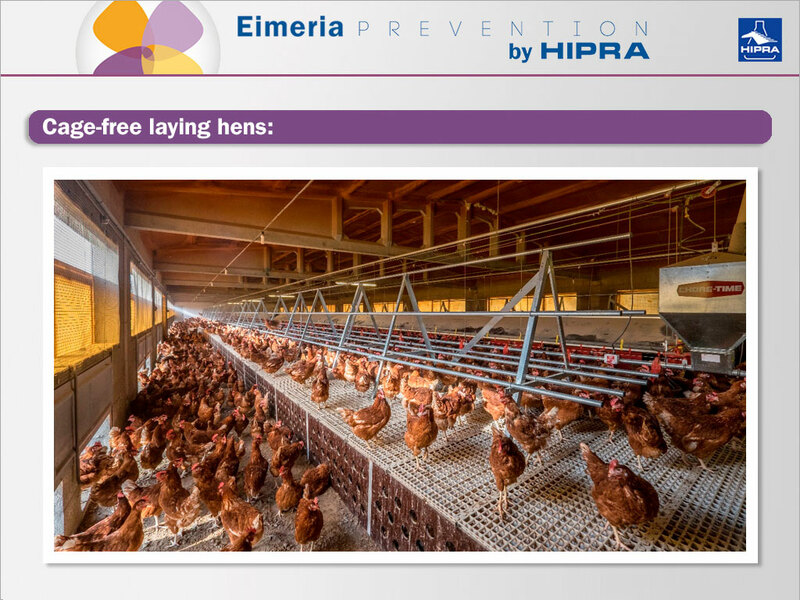 Production systems with laying hens that are floor-reared has shown a clear influence on the incidence of coccidiosis outbreaks, caused by Eimeria necatrix. The greatest evidence of this new situation is that coccidiosis vaccination in laying hens has increased considerably within the EU but also outside it. Many egg producers have taken the decision to vaccinate all their flocks against coccidiosis, as the disease has started to appear more frequently in these semi-floor type rearing systems. Many egg producers vaccinate against coccidiosis, as the disease has started to appear more frequently in semi-floor type rearing systems. But why is that? Eimeria infections appear everywhere that birds have the opportunity of coming into contact with their faeces and pecking them. When most of the laying hens were reared in conventional cages, coccidiosis hardly occurred at all and a few cases appeared on those occasions when hens could peck the manure belt of the floor above. So what happens nowadays? Hens reared on the floor or in aviary systems – where hens are reared totally or partially on the floor- clearly come into contact with their faeces. However, it could also be the case with hens reared in furnished (enriched) cages as faeces can accumulate in some areas of the cage, such as the nests, and don’t fall on the manure belt below the cage. Every contact with faeces exposes the hen to a possible coccidiosis challenge as Eimeria oocysts are ubiquitous. This is why nowadays we need to work on Eimeria prevention in all the three above- mentioned production systems: floor-reared, aviary systems and sometimes also with enriched cages. In order to find out more about the challenges egg producers have to face when vaccinating for coccidiosis, have a look at the following article: Coccidiosis and welfare-friendly production systems for laying hens. A new connection. As the date for the international conference of the National Mastitis Council (NMC) is approaching (June 2018), we’d like to give you an insight into what to expect at this year’s congress. As you may know, the hot topics of the congress will be antibiotic resistance, bedding management and mastitis and immunity, among others. We asked the NMC 2nd Vice President to answer some questions about what will be happening at the most important event on mastitis in cattle and review with him how the Congress has evolved over the last few years. After talking to several vets, we realized that they don’t check the milking machine as often as they should. We will not get tired of repeating this message: the role of the milking machine is crucial to the prevention of mastitis in cattle! We have created this series of posts in order to facilitate your approach to the milking machine and avoid the risk of having contagious mastitis in cattle. In previous entries, we described the milking machine to you, and then we also gave you some tips to check the milking machine visually. In this third post we will provide you with a list of easy parameters to check during your visit to the “boot cleaning” place so you can prevent contagious mastitis in cattle. The term “static testing” has traditionally been used to describe tests that are performed with the machine running but with only air flowing through the system (Reinemann, 1996). Vacuum levels in the plant: Vacuum levels are checked at various locations throughout the plant to ensure that there is no significant loss of vacuum between the pump and the teat end, and that the plant is set at the correct level. A drop in vacuum level would indicate that air is leaking into the system. The accuracy of the vacuum gauge is also checked. We have talked before about the role that incorrect vacuum can play in causing mastitis in cattle. Vacuum reserve: Adequate vacuum reserve is needed to ensure that stability of pressure is maintained in the plant throughout milking. The ISO has made several recommendations for vacuum reserve. It must be remembered that these are minimum recommendations, and ideally, new plants should exceed these levels significantly. Note the vacuum level (preferably, in or near the receiver) with all units shut off. Then, open the vacuum shut-off valves to one unit (or two units in systems with more than 32 units). If the vacuum level does not fall more than 2 kPa, then the Effective Reserve is likely to be adequate. If this test is carried out under the same conditions each month, and the vacuum level recorded for 1 or 2 clusters when fully open, then gradual changes in reserve pump capacity due to air leaks, pump wear or regulator malfunction can be monitored systematically (NMC, 1998). Regulator function: It is important that the regulator functions correctly so that a stable vacuum level can be maintained throughout milking. Regulators commonly become blocked with dirt, thereby reducing the amount of air leaking into the system, but occasionally the mechanism becomes defective. Pulsation: The most common pulsation faults include cracks or splits in the pulse tubes, foreign material (dirt, grit, straw, feed particles or insects) under the pulsator valve seats or lodged in the air inlet ports (NMC, 2006). The role of the milking machine is crucial to the prevention of mastitis in cattle. General condition of the plant, rubberware, etc. : The plant should be examined for any perished rubberware, leaky valves, etc., and its overall condition noted. Liner condition should be assessed and the frequency of change checked to ensure that the liners are replaced at the correct intervals. All these points can fail due to the use and non-optimal maintenance of the milking machine, and every point that fails is another factor that can have a huge impact on mastitis in cattle. We hope you find this information useful, and now is the time to apply these tips. Remember to subscribe to our Uddernews if you want to receive updates! nacAuthors: Nicola Rota (Udder health and milk quality consultant).